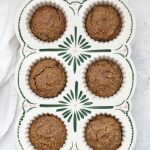 Cinnamon Pecan Muffins – Warm, cozy, and satisfying. 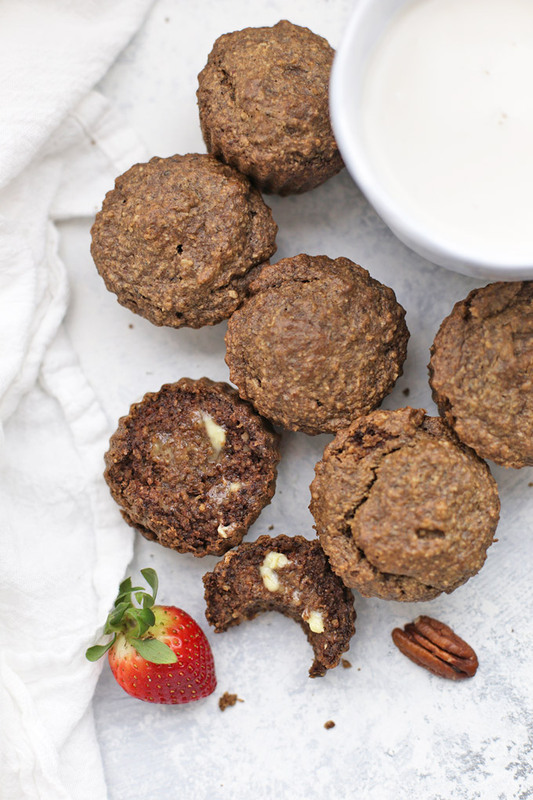 These gluten free, vegan muffins hit all the right notes for me! They’re just sweet enough without feeling like a cupcake, and the texture is hearty and satisfying without being too dense or heavy. “Cupcakes are muffins who believed in themselves” is maybe one of my favorite food quotes. It always makes me laugh. Muffins often get a bad reputation, but I love them and so does my family. We make regular batches of these pumpkin chocolate chip muffins (even in the spring and summer) because my kids love them so much, but I’ve been on the hunt for something a little different. My goal was to come up with something made from pretty wholesome ingredients that was easy and not too expensive. Gluten free baking adds up fast, so I didn’t want to use too many flours or specialty ingredients. These completely hit the mark for me. They’re not too sweet, the ingredient list is very straightforward, and they’re hearty and satisfying without being too dense or heavy. These completely fit the bill. It turns out the trick was combining oatmeal and nuts to come up with a really nice texture. I tossed all the ingredients in my blender and they came together in no time. The cinnamon and pecans work so well together here and give the illusion of more sweetness without needing to overdo the sugar. As for sweetener, I used a little bit of coconut sugar which I like because it’s lower on the glycemic index (doesn’t cause those sugar highs and lows). The resulting flavor is rich and toasty without being too much. We LOVE these and have made them part of our regular rotation. If you’re gluten free: be sure to use certified gluten free oats. Oats themselves don’t contain wheat gluten, but farming and processing practices often create cross contamination. If you’re sensitive to gluten, stick with certified gluten free oats. Bob’s Red Mill are my go-to, but I also like Trader Joe’s brand. 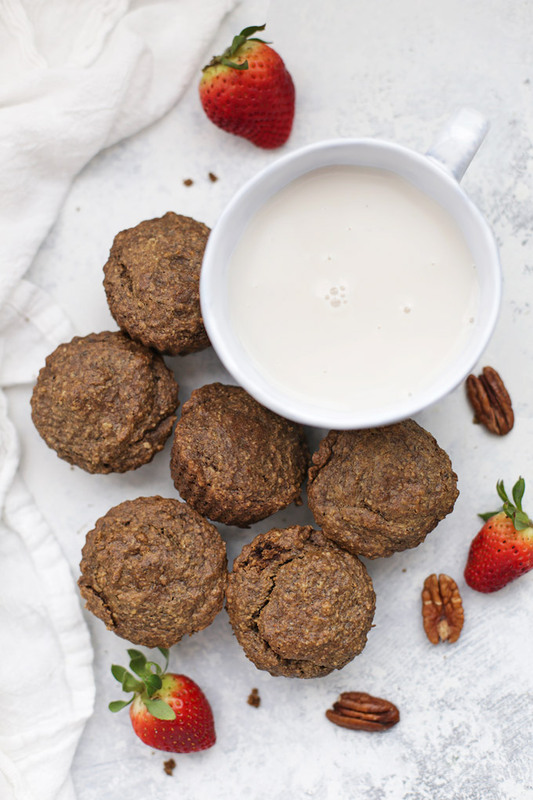 Oh Oh Oats: You can use rolled or quick-cooking oats for this recipe. You’ll be grinding them up into a fine powder, so it doesn’t matter so much. I love a good bowl of steel-cut oats, but I’ve found they don’t grind up finely enough and can create a gritty or even crunchy texture. No bueno. Chia Egg: This recipes uses a chia seed “egg” to bind it together, making this a vegan recipe. You can certainly substitute a chicken egg if you like, or you can make a flax egg by substituting 1 Tbsp ground flax seed for the 1 Tbsp chia seed. 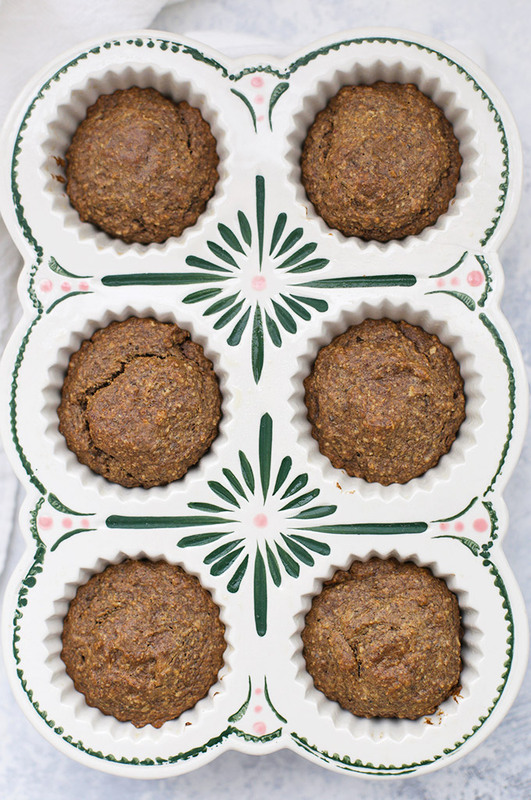 Go nuts: My kids won’t eat pecans straight up, but they LOVE these muffins. If you’re not a pecan fan, you can substitute almonds or hazelnuts. I haven’t tried these yet using seeds (like pumpkin seeds), so I can’t guarantee success if you try to go nut-free. Milk: You can use any dairy free milk you prefer here–coconut, cashew, almond, etc., so long as you are sure to include the 1/2 Tbsp apple cider vinegar. This will basically create vegan “buttermilk.” If you’re not dairy free, you can use dairy milk + cider vinegar or substitute 1/2 cup + 1 Tbsp buttermilk. 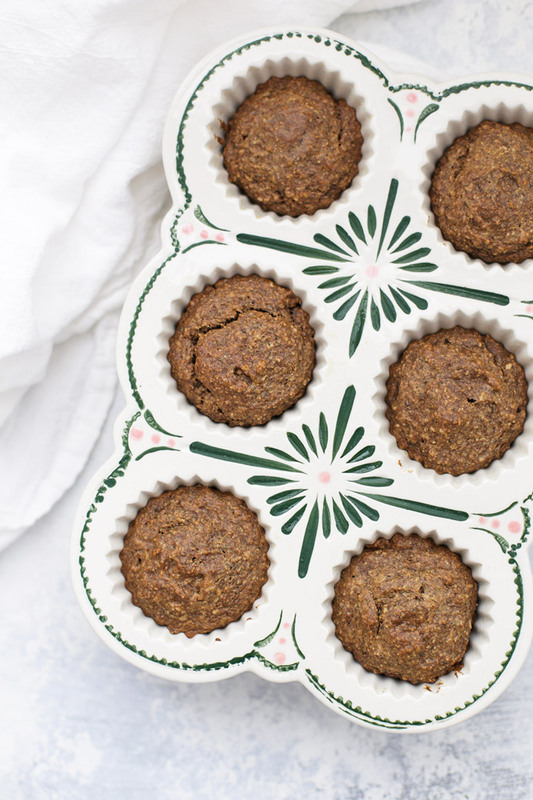 PS – The muffin tin in these photos is from Anthropologie, scored on clearance for $8. I usually use a silicone muffin pan that I completely swear by. Make the chia “egg” by combining chia seeds and water in a small bowl for 3-5 minutes. Put oatmeal and pecans in your blender or food processor and pulse until fine and powdery. Add coconut sugar, cinnamon, baking soda, and salt. Add chia egg, milk, vinegar, olive oil, and vanilla and puree until well combined. Let mixture sit about 5 minutes. Grease 6 muffin cups. Fill each with batter, dividing evenly among the baking cups. Bake at 375 degrees 20-25 minutes, or until set and cooked through. Allow to cool. 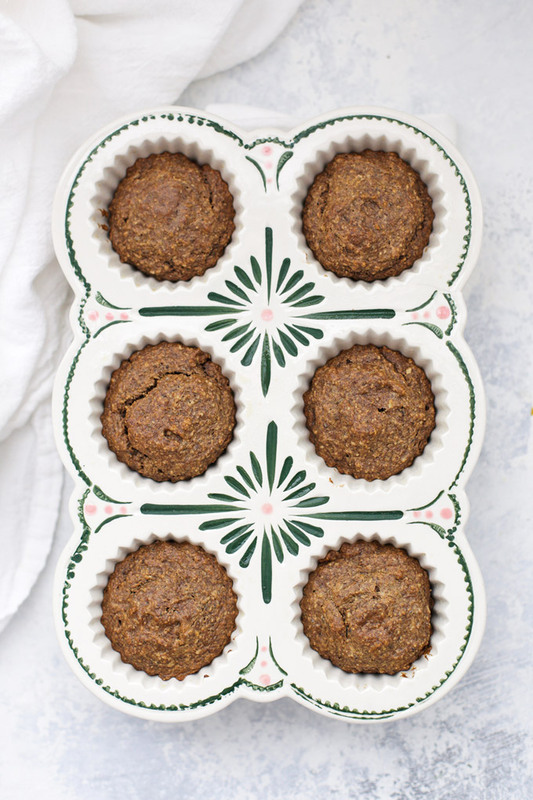 Your muffin pan is so pretty! It was a major clearance find! Anthropologie had a 30% off on top of sale prices thing going on and it was like $8! I’ve had this pinned forever but finally made it yesterday – so delicious! Husband and I had to channel some serious self-control to not eat it all at once! Jen – Totally felt the same way the first time we made them! I wanted to eat them all in one sitting! I’ve made these for three mornings straight now per my kids request (and mine of course). Every recipe I have tried of yours has been so good and I’m so grateful I’ve found your blog. 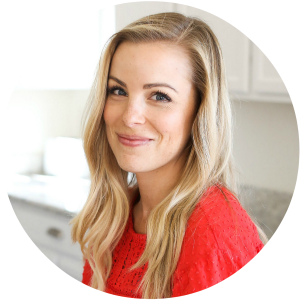 I think we are headed to a gluten and dairy free home and your blog makes it seem like it won’t be too bad. 😉you are wonderful, what a blessing you are in my life! Oh my goodness! What a sweet, thoughtful comment. I’m SO glad you are enjoying the recipes. This is exactly why I love sharing recipes. Thank you so much for brightening my day! Delightfully delicious indeed 🙂 Thank you for listing all possible substitutes, much obliged! Usually I find vegan recipes daunting, but this was easy and excellent! Thank you again! I’m SO HAPPY to hear that! Thank you so much for sharing!